Ariana Grande won 2018 with her instantly iconic, celebrity-filled "Thank U, Next" video and now she's back at it in the New Year with another debut that's sure to go viral. She released her video for "7 Rings," which racked up 1.6 million views in just 12 hours. While there's a lot to love about Grande's latest video, we zeroed in on one fashion element: her over-the-top crystal earrings. 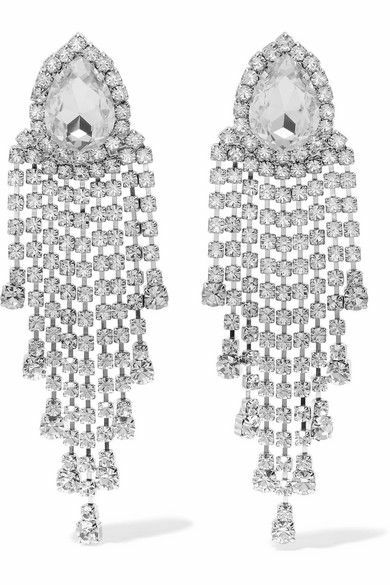 We've been talking about crystal jewelry for a while now, from our editor's favorite $10 pick to our favorite crystal drop earrings from brands like Christopher Kane and Miu Miu. Grande's new music video might be the peak of the Instagrammable crystal jewelry trend, and we're definitely not complaining. Scroll down to watch her new "7 Rings" video and shop the jewelry trend at a variety of price points.